Strong Place—which is not on Strong Place, but a block away, on Court Street—is the third Cobble Hill venture by the folks behind the juice bar Nectar and the wine bar Bocca Lupo, and to my mind the most successful. 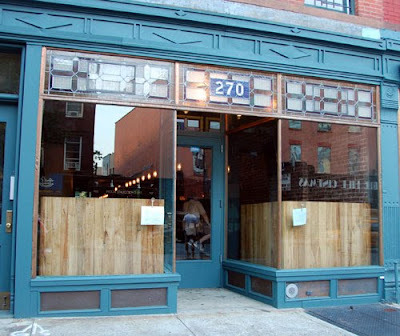 (As a wine bar, Bocca Lupo always felt like a missed opportunity to me.) The look is very clean, stark and wooden, with a couple of wood booths up front, a long bar to the right and a few more small booths at back. Beer is the story here, drink-wise. There are wines, but nothing to shout about. 24 drafts in all, mainly craft beers and all from the U.S. Fine and reliable names such as Captain Lawrence, Sixpoint, McNeill's, Avery, Allagash and Victory are all in evidence. I like how they've zeroed in on a few excellent, smaller breweries and stood by them, offering a few beers by each. The draft names are displayed on little pieces of rough paper in front of each tap. (There's a printed menu as well.) I had the Captain Lawrence's Kaptain's Kolsch, a worthy version of this top-fermented Cologne style, and tasted the Allagash Black and Avery Ellies Brown Ale. (The bartender, who was friendly, was liberal with tastes.) Beers were between $5 and $8. There were also a dozen beers in bottles and a couple in cans. The food menu seemed interesting. I liked the brats and clams, Porter braised beef brisket and the "Ipswitch Style" oyster sandwich options. And Hurrah for the kids menu! But I was in the mood for raw oysters. So I and my friend ordered a dozen, composed of six different varieties. The bivalves were good, some quite good, though the busboy and bartender got points off for not knowing which oysters were which, and for wanted us to eat them faster, because the tray was getting the counter wet. Still, there's a good atmosphere here. And I mean not just the vibe, but the actual air. The oxygen in Bar Great Harry—Strong Place's main competition in the area for good beer drinking—is often on the stale side. Some days, it has a scent I usually associate with 50-year-old dive bars. It may sound like a silly issue, but it does come into play for me when choosing a watering hole.